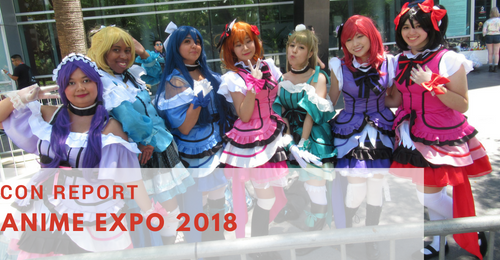 Anime Expo took place on July 5-8, 2018 in downtown Los Angeles at the Los Angeles Convention Center. This is their 10th year at the Los Angeles Convention Center. 110,000 otaku’s from all over the world came to the biggest anime con ever. This was also the hottest AX – Los Angeles was hit with a heatwave of over 100F through the convention weekend causing otaku to take refuge inside the convention center. However, Anime Expo also brought in god-tier guests. Aquors performed on day zero at the Microsoft Theater. AniSong World Matsuri made a strong comeback bringing in m-flo, Cinderella Girls, AKB48, Yuki Kajiura, and more! Go Nagai, Yui Horie, and Mari Ijima also made appearances at Anime Expo.